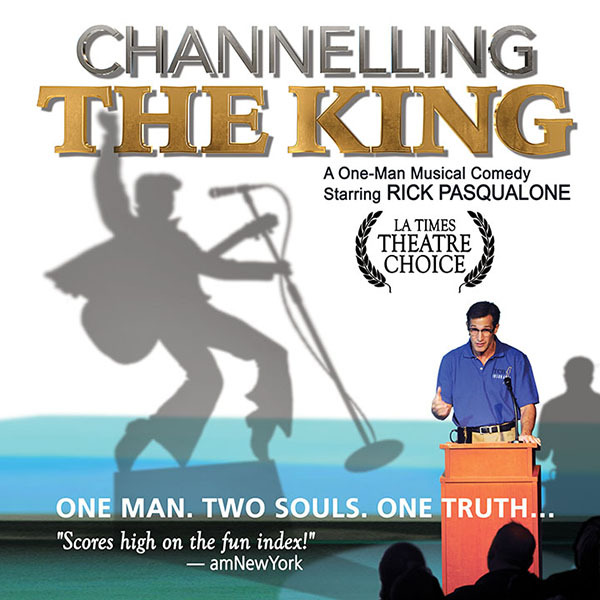 CHANNELLING THE KING – CHARLOTTE PLAYERS JAN. 29TH, 2019 | Love Productions Inc.
Channelling The King is a lively, fun, and touching one-man show that explores the relationship between Jessie Haldeman, an insurance salesman from Long Island, and Elvis Presley. The audience is entertained with Elvis songs and a story that connects Jessie and Elvis. Jessie Haldeman’s mom started her own life insurance company, TCB Insurance, in 1972 with a loan from an ANGEL. She passed away in 2005 and since then, Jessie has been running TCB Insurance and regularly gives “seminars” to people, trying to convince them the need for life insurance. As rumors begin to swirl that Jessie channels Elvis, attendance greatly increases at Jessie’s seminars. The show is a multimedia production that will delight all the senses, and highlights a side of Elvis that is rarely (if ever) seen by audiences. Elvis Presley was not only the greatest performer to ever live; he was a father, a son, a husband and a wonderful friend to so many. And he was damn funny!